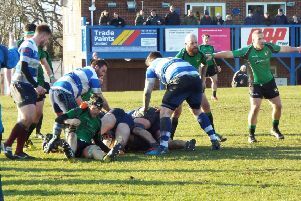 Hastings & Bexhill Rugby Club is keen to make the most of a favourable run of fixtures at the end of 2015. Having now faced every other team in the top half of the table, all of H&B’s four remaining Kent One fixtures prior to Christmas are against bottom half sides. Head coach Chris Brooks said: “As long as we can maintain some consistency, it’s a good opportunity to rack up a few wins and work on a decent points difference as well, which could become essential towards the end of the season. “Although I will only ever concentrate on the win first, once we’ve got a win tucked under our belts, we need to be looking at scoring as many bonus points as possible. They’re absolutely critical, especially when you’ve got a very tight middle group in the league. Last weekend’s 22-13 win away to Southwark Lancers nudged H&B above their victims into the top five, although they are still seven points adrift of the leading trio. Next up is a visit from 10th-placed Brockleians - who have lost six of their first seven matches - tomorrow (Saturday). Kick-off at Ark William Parker Academy is 2.30pm.